Dublin (From the Irish Duibhlinn meaning Black Pool, but its official Irish name is Baile Átha Cliath meaning Town of the Ford of Hurdlesnote A "hurdle" in this context was a frame of sticks forming something like a gate - fords made of these things were what Dublin once had before it had bridges, and the word has nothing to do with the sport of hurdling.) 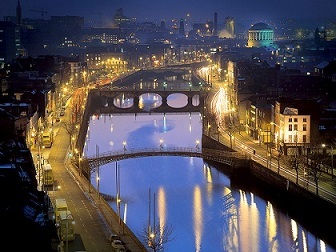 is the capital of Ireland, the third most populous Irish city in the world after New York City and Boston, and the most populous city on the island with a population of about 1 million, including suburbs, and 1.6 million including the population of surrounding counties. Officially, Dublin celebrated its millenium in 1988, but that was just a brazen excuse to hold a party: the Vikings established a stronghold in the Liffey River back in 841 (and even before that there was Eblana ). Dublin was an important Hiberno-Norse kingdom for centuries, before the Normans arrived and turned it into the centre of English (and later British) power in Ireland for centuries. Perhaps surprisingly, Dublin turns up pretty infrequently in Hollywood versions of Ireland; Hollywood seems to prefer picturesque, bucolic Irish villages. The reverse is true of Irish-made films and TV shows, almost all of which are set in Dublin — think like (English) Canadian Series and Toronto, but even more so. This is mostly due to fact that the majority of Irish production companies are based in Dublin and it makes it logistically easier to set a film or TV series in Dublin as opposed to Cork, Limerick or Galway. The River Liffey divides Dublin in two, and a good thing that it does, because we don't want those [West Brits/scumbags] (delete as appropriate) from the other side over here. Note that there are no parts of Dublin officially named 'the Northside' or 'the Southside' — they are geographical expressions, a bit like the Deep South in America. Don't worry, everyone will know what you mean. The Northside is traditionally poorer, more Catholic and, to some, more 'Irish' — it is the part you see in Roddy Doyle films. The Southside is historically richer, more cosmopolitan and more Anglophile (hence the insult 'West Brit'). Northsiders play Gaelic sports and soccer; Southsiders play rugby, which is an upper middle class sport in Ireland. Southsiders see Northsiders as druggies and muggers, Northsiders see Southsiders as... well Upper-Class Twit is a very much cleaned up version. Each side makes fun of the other's accent. I mean, no one really talks like that — roysh? Postal codes on the Northside used to be odd; on the Southside, even. note With the sole exception of the Phoenix Park, which is part of the (mostly Southside) Dublin 8 postcode despite being on the Northside of the Liffey The Irish postcode system was revised in 2014, and is ongoing, so it's all a lot more complicated than it used to be. That said, the former Dublin 4 (D4) postcode area is so Southside that even other Southsiders laugh at people from there. A popular series of books starring a D4 character named Ross O'Carroll-Kelly (both an Upper-Class Twit and a Jerk Jock) are a major hit in Ireland. The headquarters of Ireland's main television service, RTÉ, are located in the Dublin 4 district, and until around the 1990s, most Oar-Tee-Ee presenters had a Dublin 4 accent — apart from Dustin, the children's TV puppet turkey who took his Northside accent to the Eurovision Song Contest in 2008. Cork is the second city in Ireland (not including Belfast), and the largest county. It also has the most jingoistic inhabitants. Corkonians like to think of their city as the real capital of Ireland (culturally, and at sport at least), and carry on a strong—but entirely one-sided—rivalry with Dubliners. Don't worry though - by and large the "feud" is little more than a bit of craic. The only exception is when it comes down to sport, but even here the Corkonians are much more enthusiastic about the whole feud thing than the Dubs. Notably, the Northside/Southside divide also exists in Cork. However, South Corkonians are in no way the same as South Dubs. To celebrate the other millennium the city set up a 121 metre (393 ft) tall metal spire in the middle of O'Connell Street where the Nelson's Pillar once stoodnote Irish Republicans blew it up in 1966, and very few Dubliners regretted its destruction. It's... well, it's tall and metal and pointy, and possibly not the best idea to build in a city with a heroin problem. Still the Spire has inspired a few affectionate nicknames, many of them even printable ('the stiletto in the ghetto', the 'stiffy on the Liffey' or the saying 'There'll always be one prick on O'Connell Street' for instance). Fair City, Ireland's oldest original soap opera, set in a fictional Northside area called Carrickstown. Red Rock, newer soap opera by rival channel TV3, set in a fictional seaside town of the same name in the greater Dublin area. Basically, (almost) everything James Joyce ever wrote. Parts of A Portrait of the Artist as a Young Man. Love/Hate — in the city itself and in County Dublin and neighbouring counties. Many of Marian Keyes's books, especially the Walsh family books, are set in Dublin. Mrs. Brown's Boys — in Finglas, specifically. The main action of the Skulduggery Pleasant series takes place in the city. The Simpsons: The 2009 episode "In the Name of the Grandfather". It was notable for a non-Irish production, especially since it Deconstructed most of the tropes associated with Ireland from outsiders.